A new study into the trustworthiness of some of America’s most valued institutions has proven bad news for TV and newspapers. 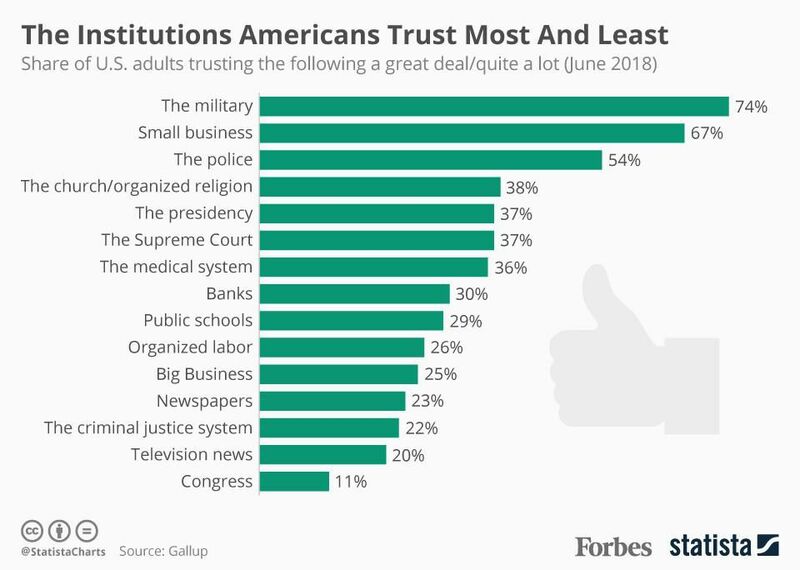 The Gallup study asked respondents about their confidence levels in 15 societal institutions, finding that only three garnered more than 50 per cent in the trusted stakes. Amerca’s military topped the list, with some 74 per cent of respondents agreeing they trusted it. When it came to Trump’s presidency, only 37 per cent agreed it was trustworthy (arguably a better figure than the President himself would’ve hoped for). However, it was bad news in the media stakes. Only 23 per cent of people said they trusted what they read in a newspaper and a further 20 per cent said the same about what they saw on the nightly TV news. Still, the survey wasn’t great news for a lot of hallowed institutions. Only 38 per cent agreed they trusted the church, banks were trusted by only 30 per cent, while everyone appears to hate congress – only a tiny 11 per cent had any faith in them.